I’ve fallen many times. My mother’s death from breast cancer knocked me down, off my feet. My triple negative breast cancer diagnosis knocked me down, off my feet. Growing up, I always heard the platitude that things are good if you land on your feet. I’m going to remove this phrase from my vocabulary. I DON’T, I never want to land on my feet again. I want to fly, high! Stuck in that place where your life is like a 1,000+ piece puzzle and you just don’t know how to solve it? As a Reconstructionist™, I’m often consumed with how to put things together to solve this puzzle of rebuilding life after a breast cancer diagnosis, a life threatening illness, a life changing or catastrophic event. My daughter loves puzzles and my late mother loved puzzles. I’ve seen each spend hours or just a few minutes to quickly solve a puzzle depending on the type, the color variations, and the sizes and shapes of the pieces. There are so many ways to solve a puzzle. I remember my mother would start by picking out all of the corner and outer pieces (any with a straight edge). She would build the entire frame first and then methodically complete the inner pieces. My daughter will sometimes dump everything out and first work on pieces that have similar colors and graphics. She will put together groupings of pieces at a time and then put those groups of pieces together to solve the puzzle and see the Big Picture. Throughout my life, I’ve seen my late mother and, now, my daughter solve many puzzles; each with her own method and timing. I’ve been guilty of feeling overwhelmed by the puzzle pieces of this “new normal” and being like an ostrich with my head in the sand. But, I’ve learned that your head doesn’t need to be in the sand. There are multiple ways to solve the puzzle, some fast and easy and some more lengthy and difficult. But, solving the puzzle starts when you open the box and dump out all of the pieces and begin to see things take shape. Think about how you will you get started working on your puzzle right now! My children love building bricks, building blocks and manipulatives. They will painstakingly work on designing them according to the instructions to insure that they look exactly like the picture on the box. When they get knocked over and shattered and pieces lost, after their anger and frustration, they go back to work. With missing pieces, I’ve still seen them make great designs. It may not look like the picture or the ideal image that they had, but it still looks good. I have to continually make sure I keep this in mind. Breast cancer and life reconstruction – physical, spiritual, financial – may not look like the picture I once had in my mind. As I’m rebuilding, I haven’t always followed the “instructions”. But, I’m still (re)building something phenomenal! The road to healing from breast cancer has been full of potholes, detours and navigational challenges. In these difficult moments, when a straight and uncomplicated path seems elusive, a response is often to seek a mentor, role model, celebrity whose narrative details their navigation from dark days to seeming paradise. I’ve found myself looking for or renting movies that recount stories of survival, tenacity, resilience and courage. They highlight the strength of someone I admire for their ability to, against the odds, persevere and prevail. I’ve used this for motivation; watched the movie or read the books or the magazine article. It’s fine to look outside for influences that can inspire and motivate us. But, I know for sure that the most inspiring person with the most motivational story, the most compelling example of fortitude is you. The role model you seek is the person looking at you in the mirror. The young survivor who pursues her PhD all while managing recurrences and multiple new treatments; a message to breast cancer that you won’t erase my dreams. The mother of two young children who trains and completes a marathon in the midst of treatment; a message to breast cancer that you won’t take my physical strength. The woman who’s battled breast cancer and ovarian cancer multiple times, undergoes a multitude of physically challenging treatments but continues to travel nationally and internationally to advocate for legislation for breast cancer patients and increased funding for research; a message to breast cancer that even if you keep coming, I’ll keep going. The young woman who takes “breaks” from chemo nausea to plan a magical and unforgettable birthday party for her daughter to maintain some normalcy for her young child; a message to breast cancer that you won’t destroy all of the treasured moments in my life. Sometimes our strength is in simply getting up to face another breast cancer day. THE FIGHT. THE GRIT. THE RESOLVE. Even in the midst of their breast cancer battles, they fight for themselves and others, hold on to dreams and keep traveling down the road, regardless of potholes, detours and navigational challenges. Some are your stories. Some are my stories. They are a potent reminder of the strength that we all have as breast cancer survivors; of the dogged determination that we draw from a well that may, at times, seem empty. We push forward against and despite the odds. The next time you need to be motivated and encouraged, reflect on your own incredible story, tap into your own fuel, step in front of and be uplifted by the role model in the mirror. On Wednesday, I spent the morning and afternoon at the National Cancer Institute (NCI) offering a survivor’s insights on the National Cancer Institute’s study of African American women and breast cancer. This is the largest ever national study on “how genetic and biological factors contribute to breast cancer risk among black women.” Along with Dr. Damali Martin of the National Cancer Institute, I conducted radio and television interviews sharing this information nationally, especially among African American women. 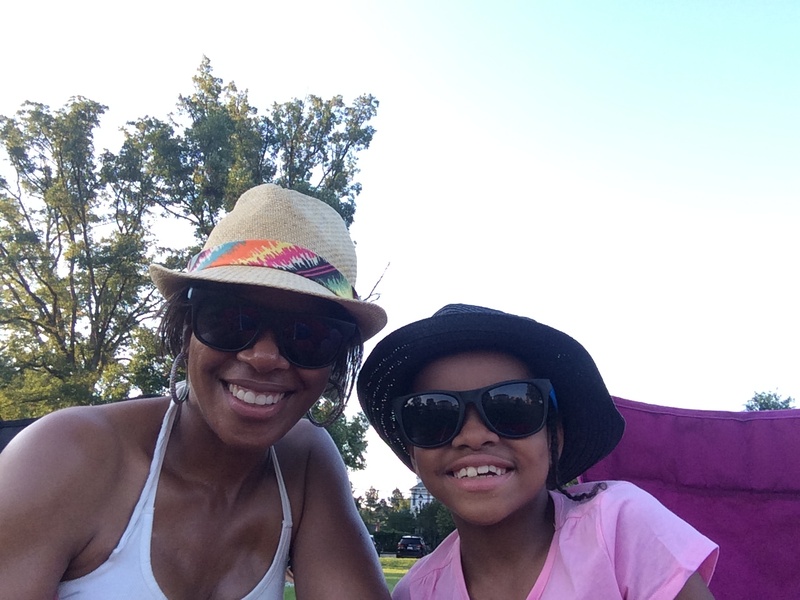 That evening, my nine year old daughter, Kennedy, and I went to an outdoor jazz concert. When I was battling cancer, I wished for motherhood moments like this. My health and my family are a priority! When I was diagnosed with triple negative breast cancer in 2008, my first prayer was for God to let me see my children grow up. I was especially concerned because triple negative breast cancer disproportionately affects African American women, young women and there is currently no targeted treatment. I was increasingly concerned because of my family history; I’m fifth generation in my family to have breast cancer and many of my relatives succumbed to breast cancer in their 30s and 40s. African American women, while diagnosed at a lower rate, have a higher rate of breast cancer mortality. All of these factors fueled my concern when I was diagnosed at 38. My daughter was 19 months old and my son was four years old. I am blessed that I have been able to watch them during the last seven years and it was nice to end the day with my daughter after being encouraged by the release of NCI’s study. One of my insights through my cancer experience is the importance of access to information. I believe that learning as much as I can about this disease and my specific subtype has helped me advocate for myself to ensure that I’m getting the best care. Seven years later, as my daughter and I listened to the soothing music, the concert ended with a Louis Armstrong tribute and the band played “What a Wonderful World”. We sat smiling (see picture above) and I thought to myself, it’s indeed wonderful to be able to enjoy this time with my daughter. As the NCI study on African American women and breast cancer begins, I am hopeful that the findings will ensure ground breaking information that leads to more ways to reduce disparities and ultimately eradicate cancer. I pray for increased survival and quality of life. I hope that my daughter and I have many more years of jazz concerts together. And, I hope that the outcomes of this study will provide many more days like this for me and Kennedy and for African American women who face breast cancer.